This year was the down run, from the City of Petermaritzburg to Durban, although that doesn’t mean it’s downhill, just that is more downhill than up, with the course having a total elevation gain of 1110m / 3642 feet with a total descent of 1779 metres /5837 feet). 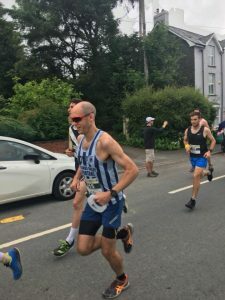 Stuart says he loved the incredible crowd support and excellent organisation of the event and absolutely recommends it to anybody silly enough to want to run 57miles. Stuart completed the event in a time of 8 hours 25 minutes which is equivalent to running two sub four hour marathons with an extra 5 miles on top. This time was 2 hours and 7 minutes faster than his previous attempt on the down run. A fabulous fifty from Fairlands ran in Thursday’s Mid Week League race at Trent Park. Low light in the woods made a tough race even trickier for some in what was essentially a cross country event. As a consequence average times were slower than for a normal 10K but there were still some great Spartan performances. CALLUM STEWART was second out of the 397 finishers in 35 minutes 25 seconds. DAN McALPINE was also top ten at ninth in 36:48. SIMON JACKSON was sixth in his category with 38:23 and STEFFAN FORD eighth forty flus 38:45. RICHARD SPRINGALL was another highly placed Spartan with 41:04. 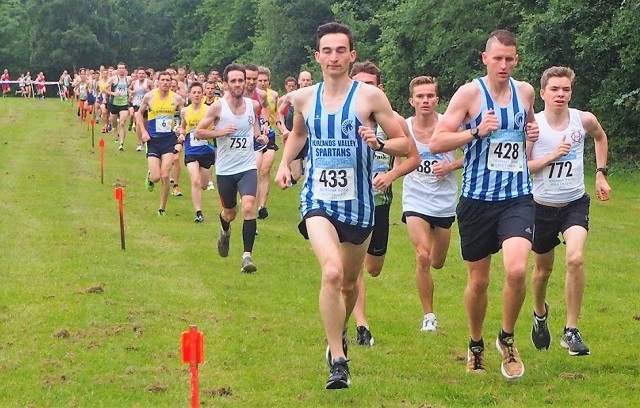 The fourth Mid Week Road Race League fixture will be in Stevenage on Wednesday evening 27th June. The start and finish will be near Ridlins Track with the course going into Fairlands Valley Park and back. (The full Spartan result from Thursday can be found near the end of this release). On Saturday SALLY McBRIDE ran the Runthroughuk 10k at Dorney Lake, Windsor. It was the first time she’d ever been there and her fourth 10k race I’ve entered but her first with Fairlands Valley Spartans. She ran a time of 1:05:04 which was a PB as her previous best was 1:06:16 at the Finsbury Park Chase the Sun. The weather was quite cloudy when we arrived but the sun soon came through and it ended up being a fairly hot sunny day. She was first female and first in her age category. In fact she was fifth overall including the men. This was a sprint distance triathlon with 10:59 for the 750 metres swim; 33 minutes 28 seconds for the 20K bike and 18 minutes 32 seconds for the 5K run. Natalie said she enjoyed the nice early start time too- 7am at Eton Dorney Olympic rowing lake and that she was pretty happy with the result having done no swimming or cycling preparation, just running, after having baby Louie in January. ANDREW PATTERSON took on the epic Man v Horse Marathon in Wales. Albeit 22 miles and not quite marathon distance it did include 4000 feet of elevation gain. The race pitches 600 solo or team of three relay runners against 60 horses and their riders. The start is in the smallest town in Britain, Llanwrtyd Wells, and after a mile you are ascending the mountain range. After a 15 minute head start the horses are chasing you down! He finished in a time of 2 hours 55 minutes. YUKO GORDON ran her fifth St. Albans Half Marathon on Sunday and it was her fifth win in the women over 55 category. She said she was quite satisfied to dip under 100 minutes with 1:39:59. 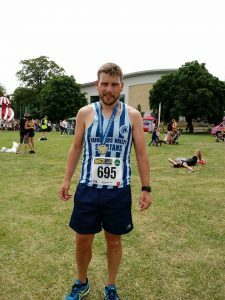 DANNY SCANLON ran his second ever half marathon and managed a PB of 1 hour 32 minutes 6 seconds.! ADRIAN BUSOLINI was fastest Spartan in 1:27:15. LIZ SMITH came in with 1:57:48; SUSAN McANENY with 1:59:50 and CLARE HOWELL with 2:20:15. Fairlands Valley Spartans were third of the seven men’s teams in Wednesday’s in the second match of the 2018 EMAC track and field league at Bedford. They are third in the league on 194.5 compared with Bedford who are second on 202 and Milton Keynes first on 275. The club’s women are in the lead. Although they were second on the night they lead the league by 257 points to 235. The third match will be in Cambridge on 4th July. EMAC organise events for veteran athletes in the East of England. Saturday’s Parkruns saw a celebration of 70 years of the NHS with a rendition of happy birthday in Stevenage and some runners donning fancy dress. At Barclay parkrun in Hoddesdon Ashley SCHOENWETTER was second overall and first female in a new PB of 20.18. In Stevenage there was another big turnout of 330 people. Todd GRAY was 9th overall in 19.43. First Spartan lady was Caroline BARTER who was second female overall in a new PB of 23.02. Other Spartan PBs to note were Danny SUTTON in 21.52 and Karl SHREEVE 27.47. Wayne MCMILLAN ran his first parkrun with Chloe EMMERSON. They both finished in 33.11. New member Melody BROWN also completed her first Parkrun in 36.24. It was great to see Roger BIGGS back. He ran/walked to finish in 39.58. In Orpington Michael O’KEEFE ran a new PB of 26.01. Alexandra WHITEHOUSE ran for a second time in Market Harborough in a new PB of 33.49. A total of 330 runners took part. A total of 256 runners took part.